1. minor matters: I've added the image links and I've corrected the errors in my previous laura posts. I'm sure I've missed some. I find it difficult to edit myself in these little blogspot boxes. 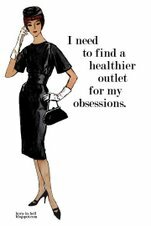 That's my excuse and I'm sticking to it. 2. ladies who lounge: I added some images to the first laura post (click here) -- discussing her lounge wear looks. I'm not sure she would approve however. And finally here are a few more comments that I want to make before moving on -- in order to clarify or correct myself or just because it popped into my head. 3. forgetting the feathers: Well I must have a door in the back of my head because I wrote that I didn't like the feathers thus completely forgetting that I had created an Entire Multi-Genre Section about the feathers with the actual word feathers in the friggin' title! So let me rephrase myself. If I were to think of the collection strictly in practical terms of fashion (which would be very unimaginative of me) then the feathers on some of the dresses are too theatrical for me. Because, you know, all the other outfits fit perfectly into my west coast lifestyle: it is just the feathers that are holding me back. As an aside, Spanish -- that beautiful, literary, poetic, absurdist and (in this country) terribly malaigned language -- has the most wonderful reflexive construction for the verb to forget: it forgot itself to me. So that's my story and I'm sticking to it. 4. new age judges It seem strange to me that the judges would consider the flapper look matronly because if there is one thing that the flapper represents it is youth. 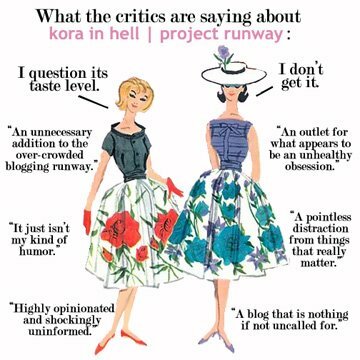 I simply cannot see how their logic operates: a flapper is matronly but an apron dress is punk and hip? Sure. a flapper style is from the past but so are fashions from the seventies and eighties. 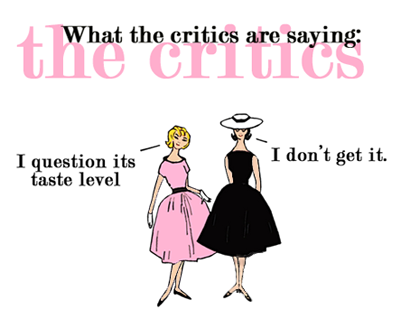 Why is a flapper dress more matronly than a bubble skirt? 5. variety show I want to talk a bit about what is meant by "variety." 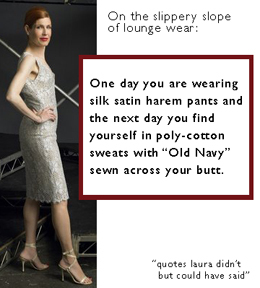 Yes, Laura's looks were all evening wear. But this is said as if this means it is a single look. As if this is a narrow category. Day wear is large. Evening is small. Whenever I see these categories and assumptions I have to push against them. It's in my nature. I'm ornery that way. Perhaps Laura's collection demonstrated that within the category of evening wear there is a great deal of variety. Laura's runway show included looks from the cocktail party and the supper club and the red carpet and the state dinner and the stage show and the box seat and the intimate dinner and the dance floor and, of course, from the bedroom. In short, she had a look for all of the elegant places of the evening. I'm not saying that Laura had the most variety. (I haven't finished my reviews so I can't make any general statements yet.) However I am questioning whether she had so much less variety in her collection than someone who had mainly streetwear, a swim suit and one fancy party dress? The answer to that question depends on how you define variety. The judges defined it very narrowly. Personally I think it is more interesting to challenge status quo definitions -- it opens up new ways of thinking about fashion and design. And isn't that the whole point? well, those results i think are meaningless anyway. i'd be willing to bet that laura is up to her eyeballs in special orders for everything from red carpet specials to debutant balls. she's probably able to charge what she's really worth. i would probably have gone against her nature to "intern" anywhere. You have a good point. I think Jeffrey -- along with some of the other unpleasant personalities from PR have had their 15 minutes of fame. I think everyone has had more than enough of them and they don't have enough talent to warrant anyone paying anymore attention to them. There are really only few designers that will have any staying power. I agree that Laura is one of them. It will be interesting to see if there is anyone else. Trixie- random comment- your blog is sooo dense and well-researched I feel like I should be giving you some sort of tuition. :-) keep up the good work! !